I'm here, don't worry. I'm just laying off-camera on on the hard, pillow-less floor. Plotting my mission to regain control of the pillows. Apparently *Prince* Waffles is no prince at all, at least by Hans Christian Anderson fairy tale standards. If he were, the catnip mouse that's hidden under that bottom pillow would be interfering with his precious slumber. Waffles is a pillow thief! Have you tried shoving him off the pillows? And then looking completely innocent?? He can sleep through that? Clearly you are right, he is no prince! Oh Katie, he has taken over ALL pillows, and you have to stay on the bare hard floor! Time for an intervention! Aw, Katie cut him some slack. He's so sweet when he's sleeping. If one cat was hogging all the pillows like that over here, there would be smacky paws. Katie, it's time fur action ... Pull the lowest pillow out! Even when Waffles is asleep he's bugging you! 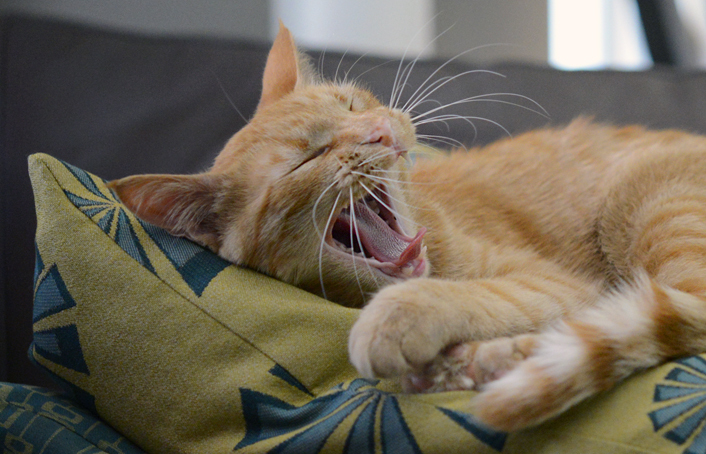 Waffles, something tells us you're in for a very rude awakening. 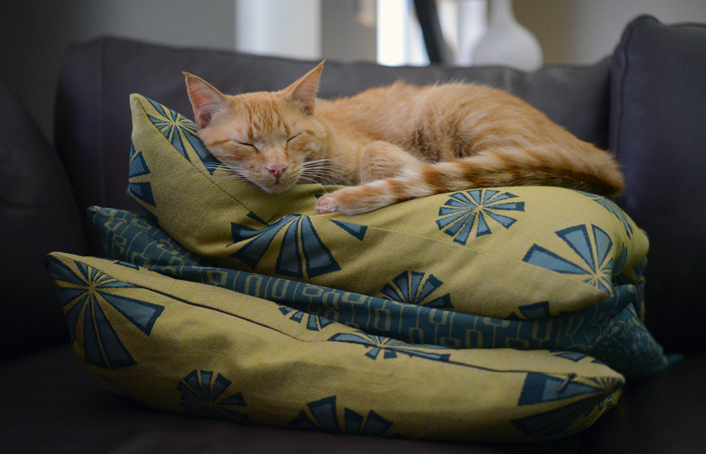 Let sleeping Waffles lie, even if they ARE on the pillows. It is better than having him trying to "play" with you. Oh Katie, what are you going to do with that Orange. Uh oh is right...the Prince awakes! Well, maybe the nip needs reloaded with some fresh stuff! Katie, there has to be some distraction that can get him off of your pillows and let you reclaim them. Tell him there's something pawesome on the bird TV he's missing! Uh oh, looks like he has been disturbed after all. Wow Waffles actually toke a cat nap. LOL. My Auntie Blossom does the very same thing with the pillows. Come to think of it, I think my Auntie Primrose does, too. Auntie Snowdrop doesn't though. Well, two out of three ain't bad. What's that peepers? Ain't isn't a word? Yeah, I kind of knew that. MOUSES! Oh, that is just wrong, Katie! You should demand your own pillows (a higher stack than Waffles'), and TWO catnip mousies! You know Katie, you could topple that pile of pillows by shoving the top one over a bit - you know - just a gentle, firm SHOVE! A stack of Waffles, MOL! We thinks he should share those pillows Katie. You mights have to make him move! we love your reference to Andersen, our Momma is Danish so it conjured up childhood memories. And Waffles we think you look cute but we don't think that "pea" will bother you one bit. We think he might just be faking it. MOL! Whip them out from under him, Katie!! Katie I sure hope you got that little brat of your pillows !! He's hogging the pillows and the mousie? That's very wrong! You need to assert yourself!! Katie, no doubt you planted that mouse to prove he's not a prince and you're the QUEEN! very clever kitty you are. We miss you being in the spotlight. We need more black and white amongst the orange melange! Allie: Katie, that's okay, I'm sure Glogirly's just awaiting the arrival of the Couture Pink Ensemble especailly for YOU to rest on - no peas included! If he were a true *royal* he wouldn't budge. But somehow I think you set him up Katie... MOL! We hate to say so, but these *are* adorable pictures. But *YOU* are the only Royalty in your house. OMC! Waffles, can you GET anymore comfy! W2 looks, er, cute in the top photo. I wouldn't call him a Prince though. BTW, Pop likes W2 so much he actually bought the Lays Chicken and Waffles chips but neither peep liked them.